Hey, you. Thanks for visiting! Are you enjoying the site? We’re loving it! It’s an amazing experience so far. <3 Right now, the site is being run and funded primarily by one person, who has a very crazy schedule and limited funds. Do you want to help out? Here's how you can! We’ve done our best to make this is as painless as possible, we promise! Contact us if you’re interested, and we’ll give you access to the task signup form. What’s involved? 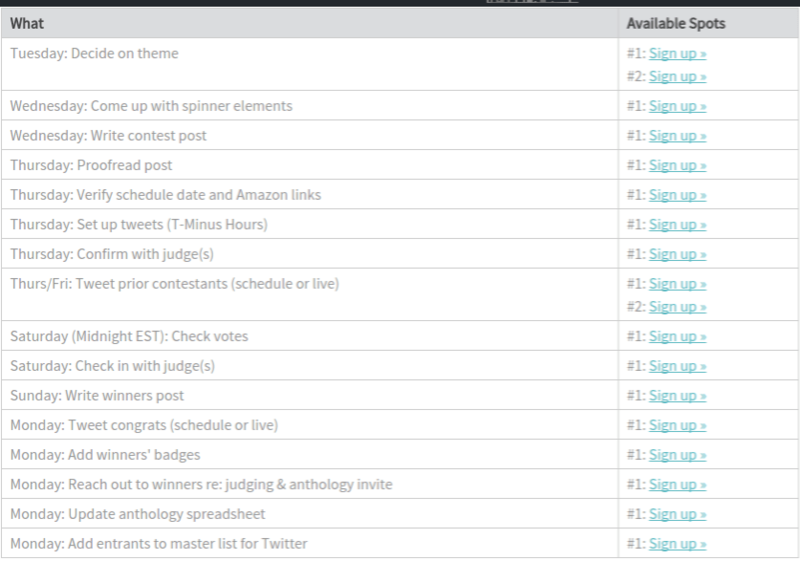 This should give you an idea of everything we are currently doing each week just to keep the contest running. Each week’s winners are invited to judge the following week. However, there will be times when they will be unable to or simply will not wish to. If that happens, we will need some guest judges on hand to take their place for that week. Contact us if you’re interested! More information about the judging process can be found here. Donating your book is an awesome way to sponsor our contest and get publicity for your book! We do ask that the books fall within certain guidelines of quality and content. Please review previous prize offerings if you’re unsure of what we’re looking for. Books (novels, collections or anthologies, etc.) should have a professional appearance, be well edited, and be available on Kindle – other platforms are a bonus. Sponsoring a contest by offering your book as a prize would usually mean that you would be willing to gift the book via the Amazon site of each winner; this entails you purchasing the book yourself and sending it as a gift (US) or sending an e-gift card of the value (in other territories, where gifting is not available), which also improves your sales numbers. However, we understand that that may not work out for everyone. If you’d like to donate your book, we can work with you. It’s just our first preference to have it sent directly from Amazon (or wherever), as opposed to a PDF file, for example. There will usually be two winners,but there could be as many as four (on rare occasions). If you prefer, you may offer physical copies of your books. As much as we wish we could, we cannot cover the cost of shipping the items, so this would have to be part of the donation process. Sometimes, the winners elect to sponsor a literacy charity in lieu of receiving that week’s prize. If this happens, you will not be required to cover the cost of the donation (equal to the value of the book being offered), although it would be greatly appreciated! There is no cost to you for the promotion you will receive as a result of sponsoring this contest, aside from the costs of your books, as outlined above. Donations go towards running the site and contest, such as web hosting fees and prizes. Time invested by admin and other volunteers excluded, each weekly contest costs just under $13 (£9) to run, or about $660 (£450) per year. If a miracle happens and we raise more than we need, funds will go towards the creation of the anthology. Although we are not ruling out such plans for the future, we are not currently a non-profit organization. As such, any donations will be out of the goodness of your heart alone, as they will not be tax-deductible.